She is proud they learn Torah in a yeshiva. 18 years ago Yael Mizrachi gave birth to quadruplets in Shaarei Tzedek Hospital in Jerusalem. This birth was covered by the media at the time. The quads and their mother endeared to the country were followed over the years. 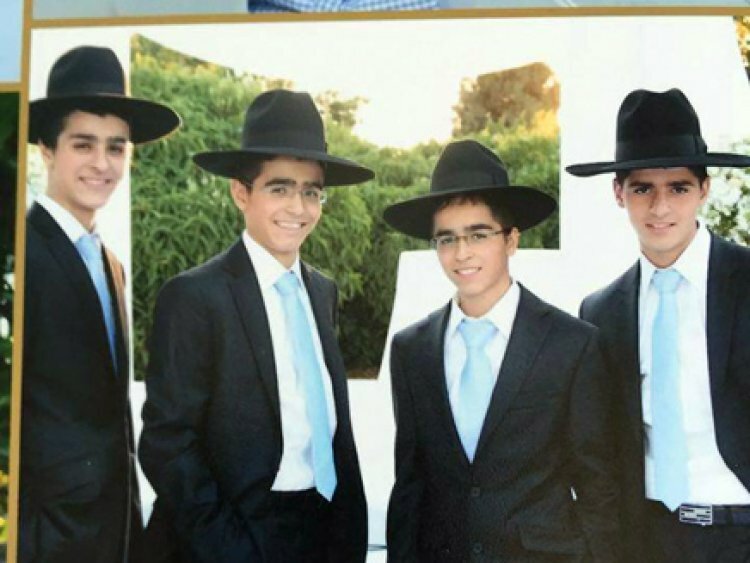 Many guests arrived at their bar mitzva 5 years ago including singer Yishai Sudri, former Prime Minister Ehud Olmert and Dr. Surina Grisaro the doctor that delivered the quadruplets. The babies grew up into young men and on advice from their rabbi each one was placed in a different school to prevent competition. There are actually 11 children in the family including 2 girls and another set of twin boys born after the quadruplets. Now these four young men are 18 years old. Their plan is to learn Torah and they don’t plan on going to the army. Their mother who is active on social media posted on Facebook recently on the occasion of their birthday. At birth one of the media photographers asked her; “so they’re going to be little “Golanis?” alluding to the Golani unit of the IDF. Yael herself has 7 brothers who all served in the IDF but her children chose a different path. Yael wrote in her post that “they won’t go to the army or travel to the Far East, get an academic degree or job promotions. They learn Torah. There is no “exemption” from Torah ever, not even for vacations and there are no large salaries either. This is their partnership their mutual guarantee. “My children stand up for soldiers on the bus and they remember their friends that are entering the army presently and they pray and study for their divine protection. Yael herself constantly has guests for Shabbat who are students and others who finished their military service, both religious and secular who come to them for Shabbat to see a Haredi family up close. “My children grew up with love for man. I’m at peace with their choice because learning Torah is the highest value and the foundation of our nation”.